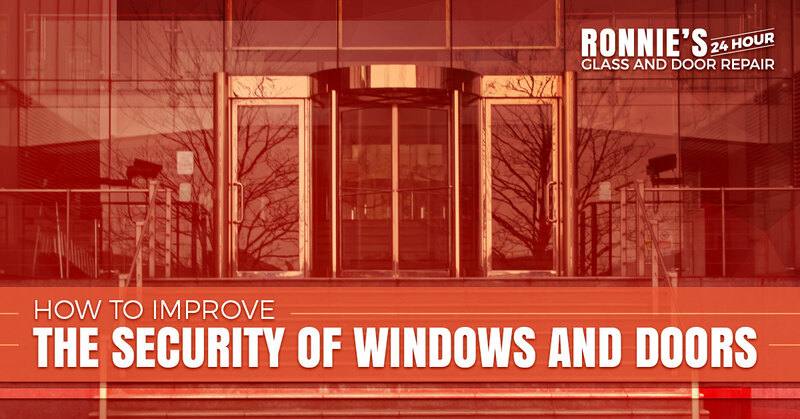 Windows and glass doors are some of the most vulnerable points of any home or commercial space. Naturally, many burglars gain access to your property through these entry points. So how do you ensure that you are protecting your home or retail store? We are going to answer this question in today’s blog post. If you are in the Fort Worth area and are in need of glass or door repair, contact Ronnies 24-Hour Glass and Door Repair. As you probably gathered from our name, we are available 24-hours a day, 7 days a week. Learn more about us and contact us today to schedule an appointment or to get your free quote. Although it could probably go without saying, we’ll say it anyway because it’s that important. The type and quality of windows and doors you use directly correlates to the security of your residential or commercial space. For example, while annealed glass breaks into big shards, tempered safety glass bursts in millions of pebbles. If you plan on adding a security window film, go with annealed glass. When secured around the edges with an attachment system, security films can be a great burglar deterrent. If the window breaks, the film will hold the glass in place, preventing the intruder from gaining access. Installing a contact alarm is a great way to improve security. Whether you go with glass-break sensors, which are set off when the glass is broken, or contact alarms, which will send an alert when contact has been broken, both of these technologies can help bolster the security of your home or business. If your home or business is using old, worn out windows and doors, consider replacing them. Old doors and windows are not only security threats, but they can also hurt the overall efficiency of your space. Not sure you can afford an update? Contact us to get a quote for your door and glass replacement. Ideally, windows and doors should be a last line of defense against burglars. Walk around your home or business, and look for ways to make it less appealing to intruders. For example, keep shrubs and hedges trimmed, preventing them from becoming a source for cover, and close blinds and curtains. You could also build a moat filled with alligators, but be sure to get this approved with the city beforehand. Emergencies can occur at any time, night or day. Regardless of whether the damage was done intentionally or unintentionally, the truth is that damaged windows and doors jeopardize the safety and security of your home or business. Therefore, it is of the utmost importance to quickly perform all necessary glass repairs and door repairs. If you are in the Fort Worth area and find yourself in need of glass or door repairs, contact us for 24-hour glass repair services. ©2018 Ronnie's 24 Hour Glass and Door Repair - Do not copy. All rights reserved.